Video attracts immediate attention because it is both visual and animated. This video background theme will impress your site visitors and keep them entertained enough to want to sign up. Jingle bells are all around, and your site's no exclusion! Keep up the cheery winter atmosphere to attract all those who are seeking love in the coldest season. 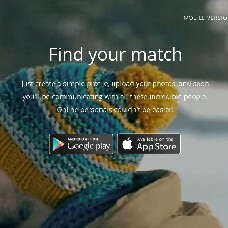 The 'Winter' video background theme applies to the landing page of a dating site built with PG Dating Pro. The theme is responsive - optimized for view on devices smaller than desktop. On a smaller screen the video is replaced with a screenshot which acts as a static placeholder image for when HTML5 is not supported. You are free to use your own video instead of the default one. To do that, convert your video into three formats: video.mp4, video.webm, video.ogv and upload them into directory landing/inc/video/ on your server. You should also replace the placeholder image: firstFrame.jpg. A video background theme will undoubtedly add the 'wow' factor to your dating website. *Please note that you cannot resell this video due to the copyright restrictions.